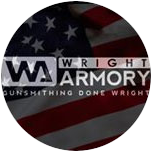 At Wright Armory we specialize in gunsmithing. It’s not something we do on the side, it’s our bread and butter. Our knowledgeable staff has worked on literally 1000’s of guns, so when we say full service we mean it! We approach gunsmithing differently than most, rather than running from technology, we embrace it. We have merged our streamlined processes with cutting edge technology to provide you with a gunsmithing experience unlike any other. We have implemented a revolutionary system that will allow you to view the progress of your weapon as it moves through the system 24 hours a day, we also provide email & text message notifications. All these technological advancements eliminate the need to play phone tag and allow you to spend more of your time doing whats important to you.